What we put in our mouths represents nothing short of who we are, or who we think we are, or who we think we should be. In the myriad of first world problems we swim in, food often is beyond caloric intake, sustenance, or even pleasure. Rather, that imported can of caviar, that foam-lathed bit of butter poached lobster tail, that century old bottle of red depicts what your suit, your car, your business card dictates. Presumptions of stature. In resuming to write on this blog, I find myself sandwiched in two divergent worlds, like pb & j and foie gras – unless someone can prove me otherwise. At one end of the table sits the machinery known as Corporate America, a merciless, meticulous creature that thumps according to its own artificial heartbeat. At the other end sits a new-found interest to reconnect with earth, the soil, the mountains, through the primitive art form known as running. Nothing foamy about that. So as I resurface with a new job and a new mindset, the most appropriate topic for this entry is the oyster. Oysters deliciously ironic. In many parts of the world, oysters – paired with that can of imported caviar – represent another presumption of stature. A little bubbly, some of them black pearls, and slurp one’s way into the first world. But if one truly thinks this through, one cannot resist from laughing. Out of the thousands of natural ingredients available to man, the oyster is one of few that takes the least pampering before consumption. Yes, lemons, horseradish, cocktail sauce are understandably on standby. 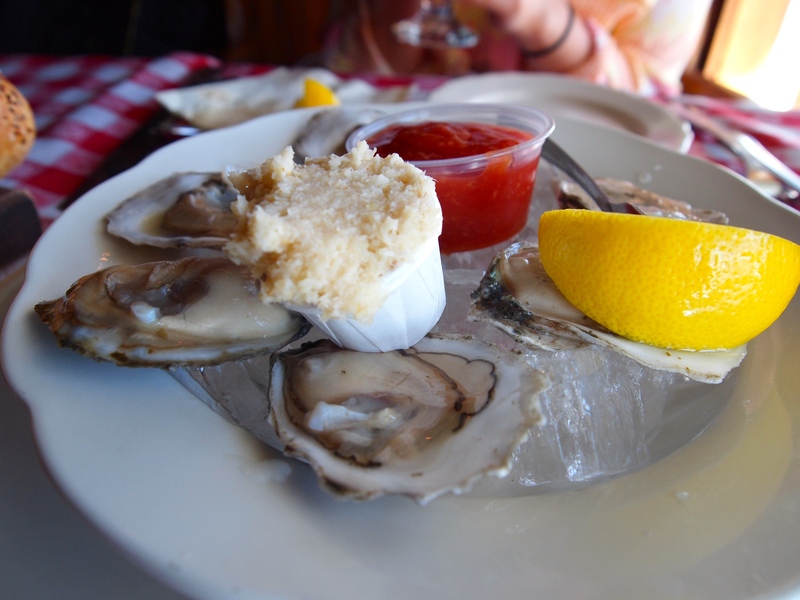 However, let us not kid ourselves; we eat oysters for their oysterness. Shuck and slurp. The most simple, primitive, minimalistic ingredient as a symbol of something more. While I cannot pinpoint exactly what that is, the aftertaste is remarkably reminiscent of tiny plates with tiny bites and green sauce spooned across. Food and coffee culture has begun a wide turn to return to its roots: good food, good coffee, good company. White tablecloth and double skim soy mocha flat something chinos are, in some instances, losing their grip to down-to-earth real cooking and meticulous coffee brewing that focus on one thing: taste. “Food minimalism” is not a new way of viewing food. It is a way of redefining who we are. It is the inherent process of stripping down to the core of cooking, which circles around food that tastes good and eating in communal fashion. Everything else is secondary. 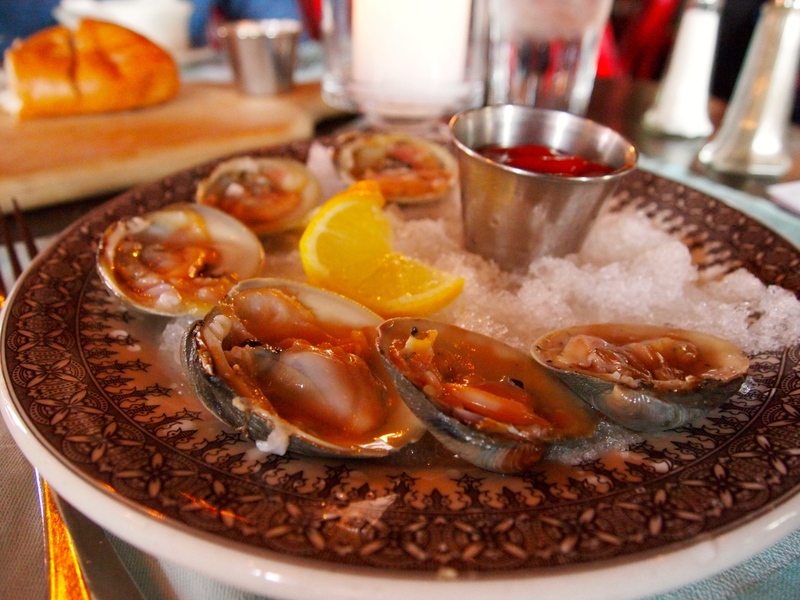 And by the way, these are clams on the half shell, courtesy of the Blue Pig Tavern in Cape May, NJ. Delicious, at a fraction of the price of their cousins.